All in an effort to avoid climbing that ladder and cleaning those gutters, homeowners have come up with some pretty unorthodox techniques. In the end, though, none rivals the get-it-and-forget convenience of a gutter system that never clogs in the first place. Of the many maintenance tasks that homeowners dread, cleaning the gutters may be the least favorite of all. But like it or not, regular gutter cleaning is a must. When properly functioning, gutters perform a largely unseen but absolutely critical function: they direct rain water—the natural enemy of any home—away from the foundation, siding, and trim. If not sufficiently maintained, gutters eventually clog and overflow, allowing moisture to go where it doesn’t belong. Often, inadequate storm drainage leads to extensive, expensive damage in the form of leaks and flooding or such related issues as mold growth and pest infestations. No matter where you live, it’s recommended that you clean the gutters twice per year—once at the end of fall and again in the early spring. If your house sits on a lot with lots of trees, it may be wise to do so even more frequently. So, how do you go about it? Well, there are plenty of ways to complete the job. Perhaps the most common method involves nothing more than an extension ladder, a thick pair of work gloves, and a bucket. But over the years, some creative do-it-yourselfers have developed their own unique approaches. Here are a few of our favorite among the unconventional tactics that people are using to wage the never-ending war against leaves. You’re probably familiar with the leaf blower as a tool that makes quick work of collecting leaves on the ground. 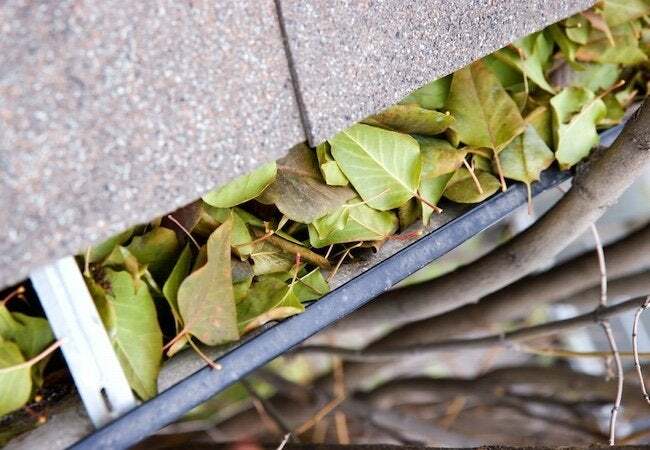 What you may not have considered: A leaf blower can also clear leaves out of your gutters. The trick is to extend the reach of the blower well beyond its usual length. Attachment kits for the purpose may be found at your local home center, or, if you’d rather not spend the money, you can always hack something together with basic plumbing supplies. Don’t have a leaf blower? Try a shop vacuum! It turns out that, simply by swapping hose locations, you can reverse the operation of a shop vacuum, turning the suction tool into a blower. The downside of either approach is that, while blown air can be effective with dry leaves and twigs, it cannot budge lodged-in dirt or decomposing organic material. Also, bear in mind that, in multi-story homes, accessing the gutters typically requires the use of a ladder. For anyone, under any circumstances, scaling an extension ladder can be quite dangerous. But scaling a ladder even while holding a leaf blower? That’s a recipe for disaster and definitely something not to do! With a long wooden handle and sturdy steel tines, cultivators belong in the arsenal of any serious gardener or landscaper. Often extending lengths up to five or six feet, such tools are most often used to break up weeds and till soil. And due to their size, they enable you to work across a broad expanse without bending or stretching to an uncomfortable degree. What makes the cultivator so handy in the yard also makes it viable for gutter cleaning, at least in a single-story home. Unfortunately, when knocking debris out of your gutter with a cultivator, the gunk has nowhere to land but around your house. So, depending on your aesthetic sensitivities, you might wind up having to clean up all the gutter debris not once, but twice. Another drawback: The cultivator does nothing to eradicate clogs inside the downspouts. In the end, although it’s messy and achieves only partial results, a cultivator can be used in a pinch—but only for single-story homes. Ironically, water—concentrated, carefully controlled streams—can be effective in gutter cleaning, especially when it comes to heavy decaying debris. If you have a garden hose connected to an outdoor spigot, you’re halfway there. The other piece of equipment you need is a long, ideally telescoping hose wand with an angled, down-pointing spray nozzle. If your hose attachment isn’t quite long enough or doesn’t have the right sort of nozzle, you can buy or make a suitable extender. Be warned: Though the method can be effective—for clearing out downspouts, in particular—you’re almost undoubtedly going to get soaked in the process, so put on rain gear before getting started. Also, expect to rinse or scrub away mud, not only from the roof and exterior walls, but also from sections of your lawn, hardscape (e.g., walkways and driveway), and planting areas. If you’re thinking, “Well, that sounds like a whole lot of trouble to go through,” you’re absolutely right! None of the above are perfect techniques, but people put up with their disadvantages. Perhaps that’s because they allow people with single-story homes to sidestep the need for a ladder. Every year, homeowners go up on ladders to clean the gutters, and every year, people fall. This can be dangerous work. Yes, there’s the option of paying a professional to handle the job, but for a twice-yearly task, the associated costs can add up to a considerable sum. Homeowners are caught between ignoring the gutters, putting their property at risk, and climbing a ladder that puts life and limb at risk. So what’s the solution here? Install LeafGuard Brand Gutters, and you never have to think about your gutters again. 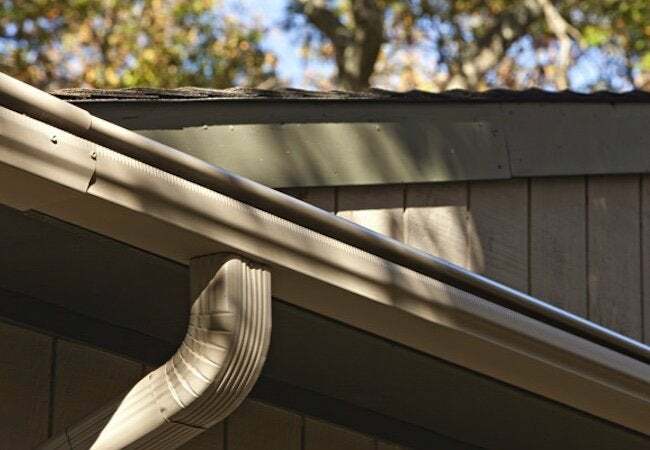 Thanks to its unique, patented design, the LeafGuard one-piece seamless gutter system prevents clogging, so you can rest assured your home is safe, while never again having to do seasonal cleaning. That’s right: Say goodbye to gutter cleaning—forever. Here’s how it works: Water flows over the curved hood of LeafGuard, then falls into the gutter, where it gets carried to the downspouts and then finally deposited at a safe distance from the home. Leaves and twigs, meanwhile, hit the hood and are deflected. 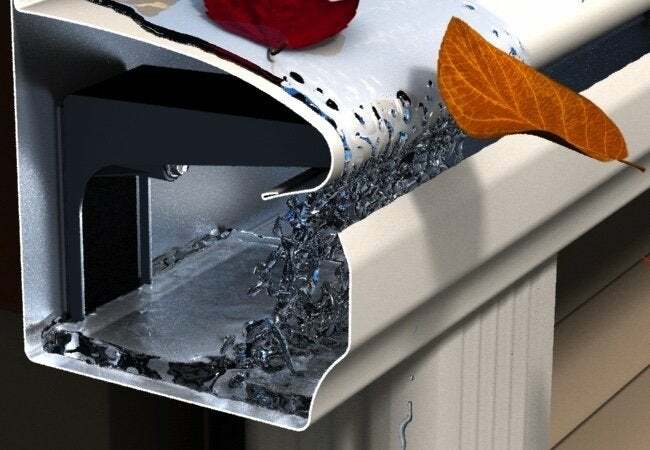 Unlike added-on gutter helmets or screens, LeafGuard offers a one-piece product with no seams and no flimsy connections. Stronger and more durable than any other, LeafGuard gutters are made from aluminum that’s 20% thicker than standard gutters. Plus, the system features three-by-four downspouts that are 30% larger than average. That means LeafGuard sheds more water, more quickly. Custom-fabricated on-site by trained and certified dealers, LeafGuard usually installs within one day, and its sleek design, available in a wide variety of colors, perfectly matches any house style. All the while, its clog-free functionality eliminate all the many moisture-related problems that homeowners so often worry about. Don’t let a bunch of wet leaves compromise your largest investment. If you want a safe, hassle-free solution to clogged gutters, choose LeafGuard Brand Gutters. This post has been brought to you by LeafGuard. Its facts and opinions are those of BobVila.com.